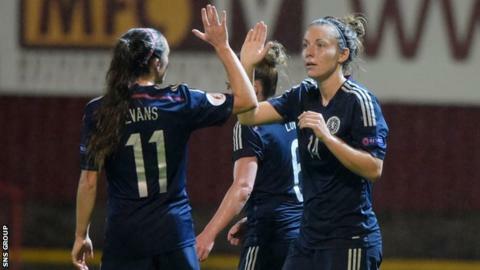 Rachel Corsie netted twice as Scotland won 4-1 in Macedonia to go top of Group 1 in Euro 2017 qualifying. Kim Little opened the scoring on 22 minutes and Corsie added a quick-fire brace soon after. A four-goal burst inside nine minutes was completed by Caroline Weir, with Gentjana Rochi replying for the hosts before half time. With three victories, Anna Signeul's side lead the group, above top seeds Iceland on goal difference. "We're happy with the four goals in the first half, but not with conceding a goal - that was really unnecessary," the Scotland coach said. "We're not happy with the performance either - the players feel we were better in most things when we played Belarus [a 7-0 win on Friday]. "But absolutely we're where we want to be. It was a solid team performance and it's tough with these short turnarounds between home and away games." As feared, Bayern Munich striker Lisa Evans failed a late fitness test and was replaced by Glasgow City captain Leanne Ross. The pitch at the Macedonian Football Federation headquarters was in remarkably good condition given that it had been churned up in torrential rain just five days earlier. The home side set out their stall with three central defenders in a 5-4-1 as befitting a side without a win for over four years. Scotland took a firm early grip of the game with Weir twice going close from a free-kick and shot. That was followed by Jane Ross playing Jo Love in, but Macedonia goalkeeper Viktorija Doneva made a smothering save. Scotland came even closer when Doneva could only parry out Weir's shot, but Jane Ross fired the rebound over the bar. Little scored a hat-trick in Slovenia last month and it was no surprise when she made it four on the road. Nobody is more composed in the box and she took a Jane Ross pass to finally beat Doneva. Four minutes later it was a Seattle Reign double whammy as Little, who is now going on loan to Melbourne City, set up American club-mate Corsie for a header to make it two. The early Macedonia resistance having crumbled, Corsie quickly added another, this time with a shot from outside the box. The home keeper had little chance with that one but should have done better when Weir's low shot slipped under her body. Although the game had the feel of a training exercise for the Scots, there was delight for the home team when they pulled a goal back just before the interval. It was prompted by captain Natasa Andonova of Swedish side Rosengard, who also play in the Champions League. In a different league from her team-mates, she sent a brilliant low through ball for Rocha to run on to and slip the ball past Gemma Fay. The Scotland captain had been a spectator up to then and the one-sided pattern continued after the break with Jenny Beattie almost scoring with a near post header. But for all their possession the Scots were unable to work the home keeper as they had done in the first half and a low key second 45 minutes in the Skopje afternoon sunshine ended with no further goals.